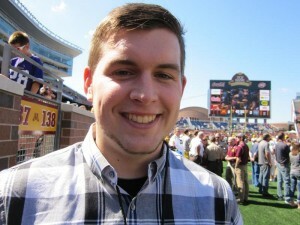 Ryan Burns, the college football recruiting authority from Gopherillustrated.com, believes Minnesota will sign one player tomorrow to a National Letter of Intent. Wednesday, February 6 is the second of two National Signing Days for high school and junior college players. The Gophers received commitments from almost their entire 2019 recruiting class back in December on the first National Signing Day. Burns said Minnesota appears ready to sign junior college defensive back Gervarrius Owens from Northeastern Oklahoma A&M. Owens is a junior college All-American who was recruited to Northeastern Oklahoma when Gophers tight end coach Clay Patterson was head coach there. Since the first Signing Day on December 19, the Gophers have also added former Notre Dame defensive lineman Micah-Dew Treadway who played in 11 games for the Irish last season. He’s on the roster now as a graduate transfer and in June will be joined by ex-USC wide receiver Randall Grimes. Treadway is expected to be eligible this fall, while Grimes not until 2020. Grimes was a promising 2017 USC recruit who has yet to establish himself in college football after redshirting last fall. Probably the most important development since December Signing Day is offensive coordinator Kirk Ciarrocca staying with Fleck. Ciarrocca turned down an opportunity last month to join new West Virginia head coach Neal Brown as offensive coordinator for the Mountaineers. After the 2017 season Cirarrocca was pursued by Auburn. “Any time you have an SEC team trying to poach your offensive coordinator, then a Big 12-team trying to poach your offensive coordinator, I think you’re probably doing something right,” Burns said about Ciarrocca, who also worked for Fleck at Western Michigan. Burns believes Ciarrocca having his best offensive personnel in three seasons at Minnesota likely was a factor in the coach’s decision to remain with the Gophers. Minnesota returns nine of 11 starters including potential All-Big Ten receivers Tyler Johnson and Rashod Bateman, and three of five players on the offensive line, a unit that at times was dominant toward the end of last season. The Gophers could have their top offensive line in years and certainly rank with the Big Ten’s best at running back with proven standouts in Shannon Brooks, Mohamed Ibrahim and Rodney Smith. The Gophers have experienced too much change among assistant and head coaches in recent years, but the situation is stabilizing including with offensive line coach Brian Callahan returning for a second season in charge. Fleck has often praised Callahan, and Burns agrees the offensive line will be among Minnesota’s strengths in the fall. Who does Burns believe will be the starters on the offensive line? He answered the unit will consist of left tackle Jason Dickson, left guard Blaise Andries, center Connor Olson, right guard Curtis Dunlap Jr. and right tackle Daniel Faalele. All five will be expected back in 2020, too, with Olson as a redshirt junior the only upperclassman among the group. The defensive line has only one full-time starter returning, senior end Carter Coughlin, but there is experience and talent available. There will be competition for starting assignments with Burns guessing Coughlin’s first team companions could be tackles Keonte Schad, Elijah Teague, and end Esezi Otomewo. In the annual spring game on April 13 fans will be particularly interested in seeing Schad who joins the Gophers this winter after ESPN ranked him the No. 2 junior college defensive tackle in the country. Coughlin, linebacker Thomas Barber and safety Antoine Winfield Jr. lead the talent and experience parade for a defensive unit that gave up 35 total points in three of the last four games. Earlier in the season the defense was often a disaster including a debacle against Illinois when a poor Illini team put up 55 against Minnesota. But that was before Joe Rossi took over as interim defensive coordinator. Since then Rossi has been given full-time authority after shutting down varied offenses in late year victories over Purdue, Wisconsin and Georgia Tech. Can Rossi work his magic for a full season? The Gophers finished with a 7-6 overall record including their Quick Lane Bowl victory against Georgia Tech. Their impressive close to the season, including reclaiming Paul Bunyan’s Axe in Madison, has caught the attention on the national scene. Minnesota is ranked in the top 25 of early listings by Sporting News and other college football authorities. Burns believes the rosy forecasts could work out on the field if Minnesota can dodge the inconsistency that characterized Fleck’s teams his first two seasons leading the Gophers. No where will consistency be more needed, Burns said, then at the quarterback position where sophomores Tanner Morgan and Zack Annexstad, despite success last year, are still inexperienced. Morgan started seven games, Annexstad six. Helping with expectations, too, is what appears to be a favorable schedule with Minnesota not playing Big Ten “bullies” Ohio State, Michigan and Michigan State. The Gophers have South Dakota State, Georgia Southern, Illinois, Nebraska, Maryland, Penn State and Wisconsin at home. They play Fresno State, Purdue, Rutgers, Iowa and Northwestern on the road. It’s no stretch right now to speculate the Gophers could be favored in more than half of their games. It won’t hurt either that the Gophers are generating more interest among the public than a year ago. There’s a push by the Athletic Department to capitalize on last year’s excitement and to make some seats in TCF Bank Stadium more affordable than in 2018. Expectations are that when season ticket totals are finalized in the summer there will be an increase from a year ago. Any success Minnesota has this fall will be looked on as a sign of even better things to come. The Gophers will lose Barber, Coughlin, Brooks, Smith and Johnson (he could be the first Gopher drafted by the NFL in 2020) to graduation but the roster is so young that Fleck has a lot to build with. As of this week that roster consisted of 16 seniors, 19 juniors, 39 sophomores and 41 freshmen.